This article is about the Altmer near Shornhelm. For the Altmer in Velyn Harbor, see Arcorion Ateldil. 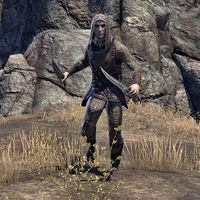 Arcorion Two-Blades is an Altmer assassin working for House Montclair found at his camp west of the city of Shornhelm. This page was last modified on 17 October 2015, at 21:37.